Reports across the midwest (Nebraska, Iowa, Kentucky) indicate that soybean sudden death syndrome (SDS) is becoming prevalent in some areas. Image courtesy Ohio Field Crop Diseases and Pat Lipps (retired). Entry filed under: crop disease, soybeans. 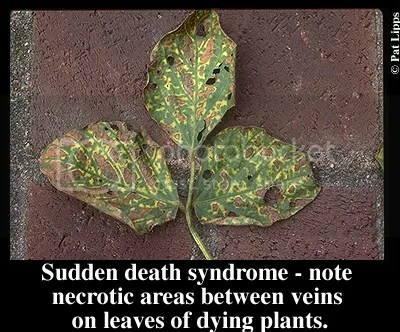 Tags: SDS, Soybean Sudden Death Syndrome.